Earn $89.99 in Rewards credit (8999 points) What's This? Rolf Prima's Hyalite ES Disc Wheelset can handle the hardest gravel epics you can imagine. Its wide 22 mm internal width is ready for large, high-volume tires, and the tubeless-ready design means low tire pressures for better traction and ride quality over the rough stuff. 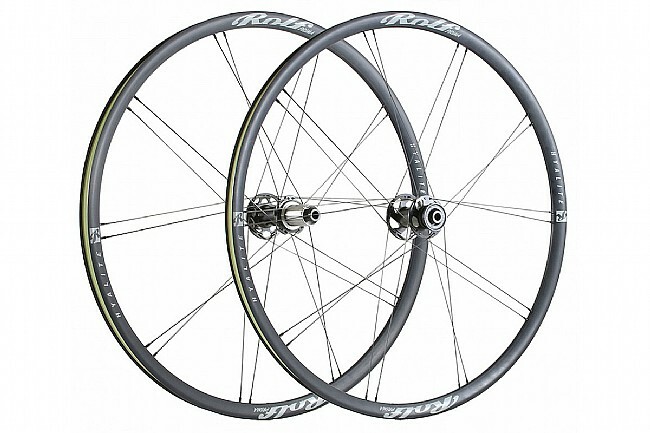 Taking inspiration from the Hyalite wheelset, the paired-spoke design keeps the rims strong and light, and they're laced to Rolf's XR Centerlock hubset to make the Hyalite ES wheels bombproof through and through. Available in various axle and freehub configurations. Compatible with disc brakes only. Being 6ft-4in tall and having a 200-pound rider weight, I have a history of performance issues with several name brand wheels. So far, I have only good things to say about these wheels. I rode the Ronde PDX Within the first 200 miles of ownership. These wheels silently climbed the steepest grades and handled beautifully while mounted to my Niner RLT. I experienced no spoke pinging or flexing creaks. Now after several hundred miles, the wheels are still true and are working perfectly. This set of wheels, with their 24 spoke count and wider rims, have exceeded my expectations. They are well assembled using quality parts. My set came with a signed certificate showing who hand built the wheels at the Eugene, Oregon factory.